ELKHART, IN. – ASA Electronics is adding the VCMS20B full color camera to our line of heavy duty Voyager observation equipment. The VCMS20B uses a 1/3-inch CMOS sensor and 19 LED lights to help deliver a high quality, full-color image even in low-light conditions. 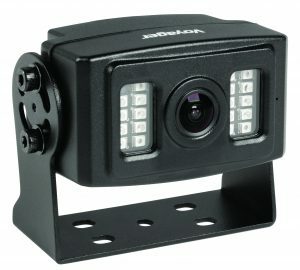 Voyager cameras are engineered to withstand the elements and the rigors of the jobsite or farm. The VCMS20B features an aluminum housing that is corrosion resistant with an IP69K waterproof rating to ensure years of reliable use. The VCMS20B is equipped with a built-in microphone and a switch that allows you to choose a normal or mirrored image. This camera will work with any Voyager monitor to create a complete observation system. The newest Voyager camera is a compact, low-profile option suitable for construction and farm equipment where saving space may be a priority. The camera itself, not including the bracket, measures just 1.61”tall x 1.82” deep x 2.75” wide. The VCMS20B runs on 12 Volt DC power and uses a mounting footprint that is identical to earlier Voyager cameras, including the VCMS155B, make updating your observation system quick and easy.